Glass shattered and ceiling tiles fell as a moderate tremor shook laid-back Southern California, rattling residents' nerves and reminding them they need to update earthquake emergency plans. No significant damage or major injuries were reported but the greater Los Angeles region vibrated for about 10 to 15 seconds Sunday night and the tremor was felt as far south as San Diego, said U.S. Geological Survey seismologist Susan Hough. "This was a serious jolt," Hough said. CBS News correspondent Ben Tracy reports that the quake rattled nerves all the way to San Diego and Long Beach. It measured magnitude-4.7 and was centered about 10 miles southwest of downtown Los Angeles and three miles east of Los Angeles International Airport, according to the U.S. Geological Survey. "First thing I thought was 'Is this the big one?' It was pretty powerful," said Long Beach resident Tom Oswalt, 46. "My first thought was to get out of the building, get my dog and get out of the building." 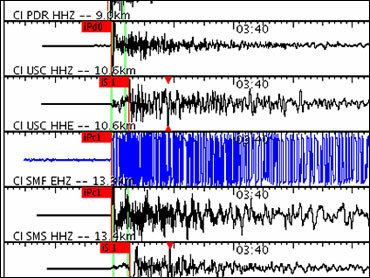 At least 10 aftershocks had followed by early Monday, with the largest registering magnitude-3.1. "People should be on their toes," Hough said. Sunday's shock was one of the most powerful quakes Carel McEachern had felt during her four decades in Long Beach. "It didn't get me out of the house, but after it was over, we all wandered out in the street and asked around and we all agreed it was the strongest one in a long time," said McEachern, 58. Charlene Ebright said she hadn't updated her earthquake emergency supplies in eight years but now she plans to do so. "I've cut out a million articles about what to do and what you need but I've never gotten around to it," Ebright said. "It just reminds you, you've got to be ready." Glass broke at a Starbucks in Torrance, and one person there was taken to a hospital for treatment of minor injuries, Torrance Fire Department dispatchers said. Ceiling tiles fell in a movie theater during a screening of "Angels and Demons" in Redondo Beach and moviegoers fled. Television images showed a storefront window knocked out of a Long Beach drapery business. "We thought the ceiling was going to cave in to be honest, so everybody started [to] run out of there," one audience member told CBS News. The shaking was most intense in the coastal communities south of the airport, including Long Beach. Carolyn Gray was reading a book at her Long Beach home when her dog, Rocket, jumped into her lap. It was the 2½-year-old pet's first earthquake. "It was a good jolt. It wasn't really a roll," she said. Mariella Freyre, 30, a waitress at Kafe Neo, a Greek restaurant in Long Beach, said she was surprised by the strength of the quake, which she felt while she talked to customers. "There were tremors and glasses started shaking," she said at the restaurant Monday. "I felt the movement on the floor. I've been in many tremors but I've never felt the floor move like that." The quake originated 8.4 miles below the surface and appeared consistent with movement on the Newport-Inglewood fault, said USGS geophysicist Ken Hudnut. That fault was responsible for the magnitude-6.4 Long Beach earthquake in 1933 that killed 120 and caused more than $50 million in damage. The last damaging earthquake in Southern California was the 1994 magnitude-6.7 Northridge quake that toppled bridges and buildings. Since Northridge, the region has been in a relative seismic lull, although activity has picked up in the past year. Last summer, a 5.4-magnitude quake was centered in Chino Hills, east of Los Angeles, but did not cause major damage. Earlier this year, an earthquake swarm shook the desert near the southern end of the San Andreas Fault. "The activity that we've seen in the past year isn't the highest by a long shot, but I would no longer call Los Angeles quiet," said USGS seismologist Lucy Jones. "Every earthquake triggers other earthquakes," she told CBS News.